Please drink (or eat ice pops) responsibly! Whew, y’all! It’s been a while since I posted on here! We’re still working on making the new house pretty (we just bought curtains this month), and while I spend a good bit of time cooking, I just haven’t made the time to blog anything lately. Place the sugar and water in a small pot, and cook on medium, until the sugar has fully dissolved. Set aside to cool. Add the wine, orange liqueur, juice of one lemon, juice of one orange and chopped fruit into a large pitcher. Once the syrup has cooled, add 1/2 cup of the simple syrup into the pitcher. Stir all ingredients together. Pour the sangria mixture (making sure to stuff it with the fruit) into an ice pop mold, filling just below the edge of the mold. (Side note: The mold I have has the molds with a cover that has slots cut into it for you to place the wooden sticks.) So, if you have a similar mold, after you pour in the sangria mixture, cover the pops, and place the wooden sticks in the slots, until it’s almost at the bottom of the pop mold. Freeze for 5-6 hours or overnight, until everything is solid. 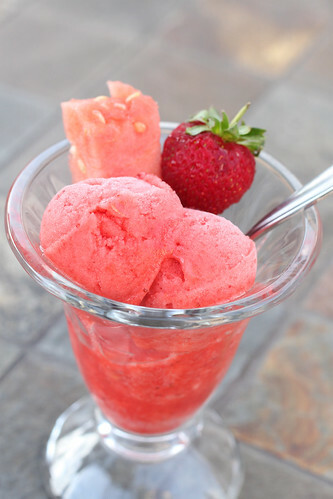 Anyway, sorbet is one of the easier recipes for an ice cream machine. Seriously…it’s just pureed fruit, sugar and some citrus mixed together. Nothing fancy…nothing to cook, and yet, it’s incredibly perfect. 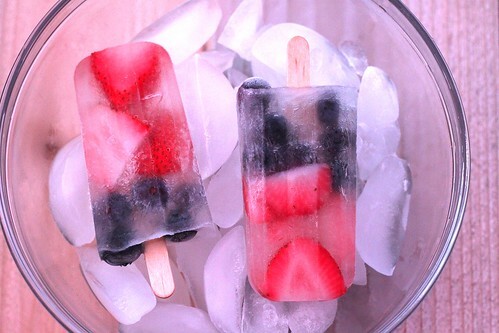 Refreshing…cooling…and sweet! Place all of the ingredients in a blender, and blend everything until smooth and well-blended. Add the sorbet mixture to the bowl of an ice cream maker, and make the sorbet according to the manufacturer’s instructions (mine mixed for 30 minutes). Enjoy immediately or place in the freezer for a couple of hours, until hardened. Bananas Foster a la Mode Cups & A Giveaway! A couple of months ago, my husband and I went to a restaurant in New Orleans. When it came time for dessert, we decided to split something, but the problem with splitting with my husband is the dessert cannot contain any chocolate, caramel or peanut butter (he hates it all). I know…poor guy doesn’t know what he’s missing! Luckily, this particular restaurant had a bananas foster torte, so I knew we were set. It was absolutely delicious, indulgent and rich. In fact, I’m SO glad we split it, because there was no way I could eat the whole thing. 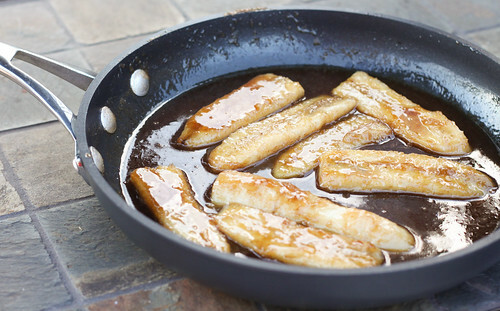 Ever since then, bananas foster has been fresh on my mind. I had to make a fun recipe with this classic New Orleans favorite. I’m thrilled to be working with Calphalon again to review their brand new Elite Nonstick cookware, which is sold exclusively at Williams-Sonoma. It’s currently for sale on their website, and will be in stores on September 27th. I’m sure you guys know that I love using nonstick cookware, but one of the biggest issues I’ve faced is being limited to wooden or silicone utensils. This line is safe for metal utensils (fork out your whisks!). Yep…I’m serious! This cookware also comes with a textured sear surface, which is awesome because you can get the sear that you usually get from stainless steel, but with the convenience (hello, easy clean-up) of a nonstick pan. This line of cookware is also dishwasher safe. Calphalon sent me this 3 piece set to review, and asked me to create a modern twist on a classic recipe, using one of the pans. With that in mind, I grabbed the 10″ pan, some bananas and got to work! 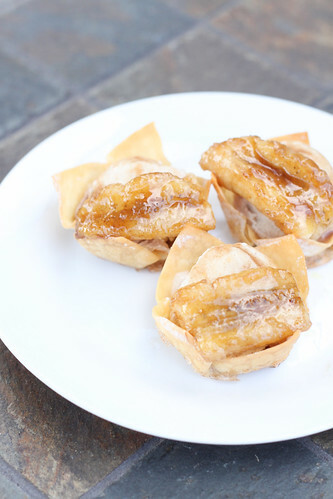 The end result is homemade bananas foster ice cream, topped with warm bananas foster, contained in a cinnamon sugar wonton cup. I hope you like bananas for this one, y’all, because there is plenty of sweet banana flavor in this recipe! For the ice cream, I omitted the rum, because even though the alcohol cooks off, I didn’t want to chance the ice cream not setting up properly. I suggest making the ice cream one day before you plan on serving these desserts, so the ice cream can be a scoop-able consistency. Is it crazy that I haven’t made any homemade ice cream this summer? I mean it’s hot enough for it, so I have no idea why I didn’t fork out the machine until September. I will say that I did have a slight addiction to skinny cow sandwiches the past couple of months, and homemade ice cream isn’t very calorie friendly, but usually calorie splurges never stop me (especially lately). I HAD to make this ice cream, though. I recently received a copy of Jessica Segarra’s (also known as The Novice Chef) new cookbook: Cereal Sweets & Treats. Jessica is a good blogging friend of mine, and I was so excited when she wanted to send me a copy of her new book. It’s full of so many fun recipes…recipes you’d never think you could use cereal with. Cap’n Crunch milkshakes, Lucky Charms macarons, Pumpkin Cheerios bars, Fruit Loops cupcakes, and Corn Pops ice cream, just to name a few. Seriously….doesn’t that all sound so fun?! If you want to check out more recipes (I think those pumpkin cheerios bars are calling my name next! ), Jessica’s book is available on Amazon for under $15! 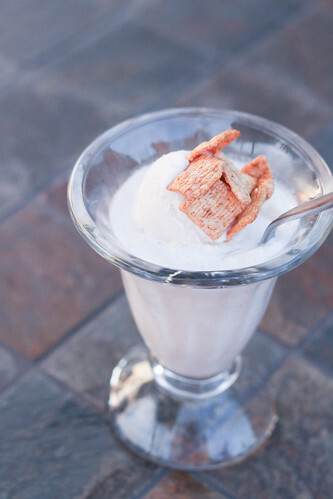 In a large bowl, mix the milk, heavy cream and cinnamon toast crunch cereal together. Allow the mixture to soak for 30 minutes in the fridge, stirring occasionally. Strain the cereal out of the mixture and discard the cereal. Place the milk mixture in a large saucepan, and whisk in the sugar. Bring the mixture to a boil, stirring constantly, and continue to boil the mixture for 2 minutes. Remove the mixture from heat, and stir in the vanilla extract. Allow the mixture to fully cool in the refrigerator, until the mixture is cold to the touch. Once the mixture has cooled, pour the mixture into your ice cream maker and mix according to the manufacturer’s instructions. The ice cream will be a soft serve consistency at this point, but if you’d like the ice cream to be more scoop-able, allow it to harden in an airtight container in the freezer for at least 3 hours. Disclosure: I was sent a copy of this book for a fair and honest review. All opinions are 100% my own. I’ve been making a ton of frozen treats lately. With the crazy heat outside, I feel like the best way to “cook” is to not use any heat at all. Sure, some ice creams use eggs, but since you have to cook the ice cream mixture in that case, I’ve been trying quite a few quick (egg free) ice cream recipes. One of my favorite ice cream treats is a Sonic Blast with Reese’s cup pieces mixed in. Reese’s cups for me is just one of those candies I can’t say no to. I can only buy them if I have a recipe in mind, otherwise I tend to black out and find myself surrounded by Reese’s wrappers. Those things are my weakness. In a brief, insane (yep, insane…I’m trying to lose some weight y’all!) moment, I thought to look up recipes for Reese’s ice cream, and I came across this one. Two great things…it comes together quickly and it’s egg free (no cooking!). Taste wise? Let’s just say that I’m thankful that I bought the fancy little ice cream cup that I have, because 1/2 cup of ice cream fits in there and in my mind, it feels like I’m eating a full bowl. I really could have eaten the whole container in one serving, I imagine. In the bowl of a stand mixer, add the peanut butter and sugar and beat the mixture for 2 minutes until it’s very smooth. Add the milk to the bowl and mix everything on low for another 2 minutes, until the sugar is completely dissolved. Add the heavy cream and vanilla extract and beat the mixture on low for another 2 minutes, until the ice cream base is well-combined. Chill the mixture in the fridge for an hour. Take the ice cream mixture out of the fridge, give it a quick stir to make sure nothing settled and add the ice cream to your ice cream machine, and churn the mixture according to your manufacturer’s instructions. Add the chopped peanut butter cups, and stir them into the churned ice cream. At this point, the ice cream will be like a soft serve ice cream. If you’d prefer a more scoopable consistency, place the ice cream in a freezer safe container and freeze the ice cream for a few hours. Enjoy! Back in high school, I worked at a Winn-Dixie as a cashier. I learned a lot of important life lessons while I was a cashier. When hosting a crawfish boil, one must buy at least 2 cases of beer with the vegetables you are about to boil. When one has a baby, a bottle of wine is a necessity when you have a cart full of baby food. Then, there were people who brought new foods to my attention, especially produce. I learned about prices of produce too…bananas were dirt cheap and cherries were ridiculously expensive. I often wondered what was SO special about fresh cherries when you could buy a jar of maraschinos for $2 or something. Now, don’t judge me. 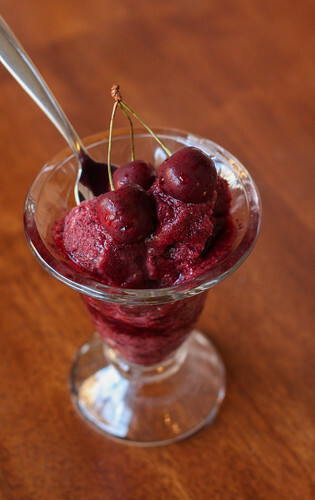 When I was younger, cherries to me were simply the top of a sundae. 🙂 Sure, I enjoyed plenty of fresh fruits, but cherries weren’t one of those when I was a kid. And I completely understand why…being 1 of 4 kids, I’m sure buying cherries for a family of 6 would be ridiculously expensive. Mix 1 cup of sugar and 2/3 cup of water in a 2-cup measuring glass. Microwave the mixture for 2 minutes, and allow the syrup to completely cool before continuing with the recipe. Then, add the sugar syrup, cherries, brandy and lime juice to a blender and puree for about 1 minute, until the mixture is smooth. Churn the sorbet in an ice cream maker, according to the manufacturer’s instructions. 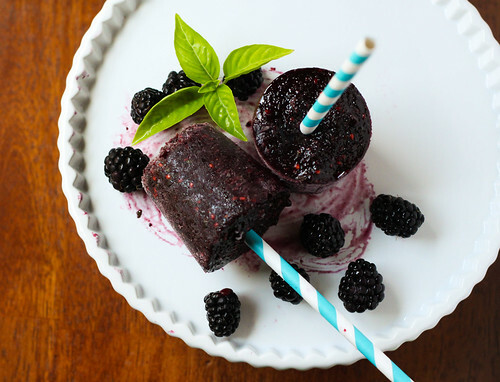 Add the sorbet to a freezer-safe container, cover and freeze for 4 hours (or overnight), until firm. Enjoy! Because I’m paranoid, I just want to disclose that I’m not encouraging ANYONE to eat cookie dough containing raw eggs, like Pillsbury dough…I don’t want to get sued over this post darnit! Anyway, since I have been seeing cookie dough all over the blogs lately, I just had to make something involving it. The craving was just too strong. I had some heavy cream in the fridge, and I figured that it would be the perfect excuse to make some ice cream. 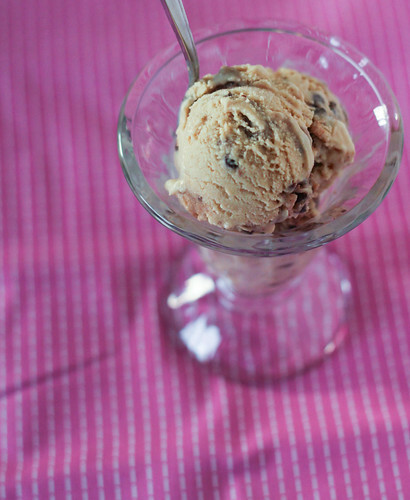 I had this recipe from Annie’s blog starred for quite a while, because it wasn’t your ordinary cookie dough ice cream. No…it was DOUBLE chocolate chip cookie dough ice cream. Oh man, y’all. Not only are there chunks of cookie dough in there, but the ice cream is also cookie dough flavored. Once I finished making it, it was SO hard to not eat the whole batch right out of the ice cream maker bowl. Seriously. In fact, that little ice cream bowl you see in the picture is my secret weapon while I’m calorie counting. It’s dainty, makes me feel all sorts of fancy, and it fits two scoops of ice cream on it. For this gal who could put away a pint of ice cream, this is awesome. Portion control y’all. I’m learning. To make the cookie dough chunks, stir the melted butter and sugar together in a mixing bowl until everything is smooth. Add in the flour, then the vanilla and mini chocolate chips. The dough will be very soft before chilling. Form the dough into a disk over some plastic wrap, wrap the dough well in the plastic wrap and refrigerate until the dough is firm. While the dough is chilling, make the ice cream by first melting the butter in a medium saucepan over medium-high heat. Stir often over the heat (to avoid burning), until the butter is a deep golden brown color. Whisk in the heavy cream and heat the mixture until simmering. While this is going on, in a medium bowl, vigorously stir the egg yolks and the brown sugar are pale and fluffy. Once the cream mixture is warm, add a small amount of the cream mixture to the bowl with the egg yolk mixture, whisking well. Once that’s done, slowly whisk in the rest of the cream mixture. Then, add in the salt and return the egg/sugar/cream mixture to the saucepan and heat the mixture until slightly thickened, (the temperature should read 170-175 degrees on a thermometer). Immediately take the saucepan off of the heat and pour the mixture through a fine sieve into a bowl. Stir the vanilla extract and milk into the egg/sugar/cream mixture until well-mixed. Then cover the bowl and chill the ice cream mixture thoroughly in the refrigerator. Once the ice cream mixture is chilled, churn the ice cream in an ice cream maker (according to the instructions on your specific ice cream maker). 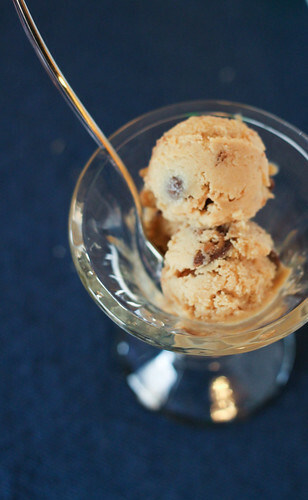 While the ice cream is churning, chop the cookie dough into small chunks. Once the ice cream is done churning, transfer to a freezer safe bowl or container and stir in the chocolate chips and cookie dough chunks. Freeze the ice cream in the freezer for a few hours (or until firm) before serving. I’m always the gal looking for a deal. It makes me cringe to go shopping and pay full price for something. While you won’t find me on Extreme Couponers, I do tend to stalk the deal sites, like Slick Deals and Fat Wallet. It’s a good day when I find an item at Target for 75% off or 90% off, too. Even for my weight loss rewards, I fully intend on getting the most out of those rewards, like finding that ::99 lbs. lost:: designer handbag on sale. So, I happily took those strawberries home and made multiple recipes using them. This was the last recipe from that flat (boo…). I usually make a sorbet, but this year, I wanted to give sherbet a try. 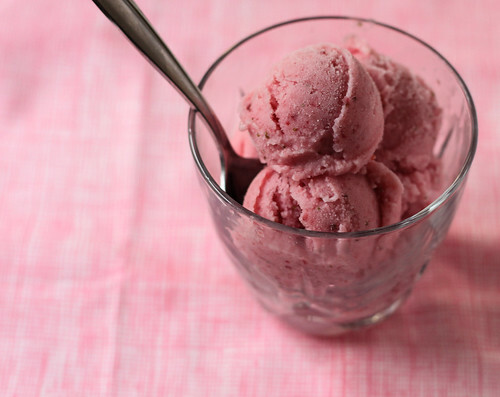 Like sorbet, this is a great refreshing dessert. 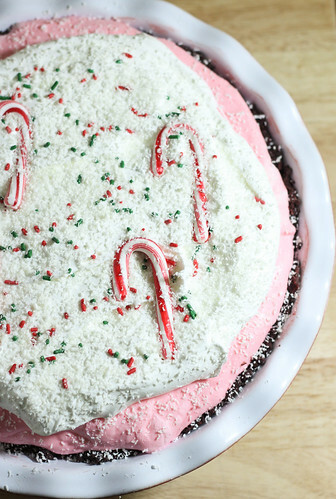 Oh, and best of all, this is an extremely simple recipe to throw together! Puree the strawberries in a blender or food processor, for about 30 seconds until the berry puree looks smooth. If you don’t prefer seeds, pour the puree through a strainer into a large bowl, pressing down the puree to make sure you’re just straining the seeds out. Add the buttermilk, sugar and extract to the bowl and mix everything (you can just use a spoon or a whisk) until everything is well-mixed. Then, cover the sherbet mixture and chill in the fridge for an hour. After the mixture has chilled, pour the mixture into your ice cream maker (at least 1 1/2 quart capacity) and freeze according to the ice cream maker’s directions. You can enjoy this right out of the ice cream maker (for more of a soft serve consistency) or freeze the sherbet in the freezer for a few hours to enjoy at a scoop-able consistency.